Windypundit - Page 3 of 492 - Classical liberalism, criminal laws, the war on drugs, economics, free speech, technology, photography, and whatever else comes to mind. My list of reliably entertaining fiction authors has become too short, so I’ve been spending a lot of time lately poking through the Amazon Prime discount bin trying to find new authors to read. Lately, I’m looking for military sci-fi or space opera. After a batch of disappointing starts — some books are free to read from Amazon for a reason — I decided to check out a well-known series that wasn’t free, but that would probably be decent: David Weber’s Honor Harrington series. I’m part way through the first book, On Basilisk Station, and it seems to be fairly well written and plotted, but…parts of it are just painful. When Captain Harrington arrives in the Basilisk system, her command assumes responsibility for customs enforcement, including making sure everybody is paying the tariffs on the goods they are shipping. They do this by stopping and searching every ship that passes through — without a warrant from a judge or articulable probable cause (or the sci-fi equivalent) — and if they find something, they seize it without any apparent judicial proceeding. In parallel with one of the worst feature of American civil forfeiture, the ship’s crew are rewarded a fraction of the value of the seized merchandise, which in real life creates terrible incentives. I’m pretty sure they will eventually stumble upon some enemy activity and get into some cool space battles, but this part where the supposed hero of the series is stealing from hard-working merchants to finance the Queen’s government is hurting my libertarian soul. And now it looks like they are also going to be doing drug interdiction. Sigh. The “Model Justice” series of posts (starting here) is chronicling my attempts to build a software model of certain aspects of the criminal justice system. As I explained in the most recent post, my first attempt at building a model ran into a dead end, so now I’m figuring out what to do for my next attempt. Allow defendants to have some degree of risk love instead of risk aversion when making plea bargaining decisions. 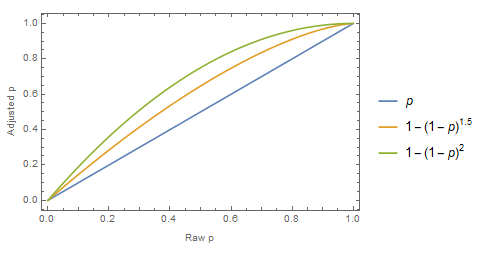 Allow risk preferences to vary depending on case quality. Allow limits to the extremes of case quality. E.g. Always some chance of acquittal/conviction no matter how strong/weak the case. Allow prosecution and defense to have different views of the quality of the case. Allow mixes of different types of cases. E.g. Different severity of crime. Incorporate the way absolute sentencing severity — including collateral consequences — affects risk tolerance. Incorporate the effects of defendants being stuck in jail pending trial. I also want to switch to a different model of plea bargaining — one informed by economic thinking — that I’ll describe in a future post. Before I can do any of that, I need to make a big change to my approach. The system modeling tool I’ve been using, Insight Maker, is designed to model entities that transition through a series of states. That seemed appropriate tool for modeling a defendant going through various stages of the criminal justice system: Arrest, pre-trial, trial, jail, release, and so on. However, nearly all of the things I want to change will have an effect at only one point in the process: Plea bargaining. Even things that do not happen until after the trial — prison, collateral consequences — are only part of the model because of how they affect plea bargaining. So the cumulative effect of all these changes will be to greatly complicate the model’s plea bargaining logic. You can add code to an Insight Maker model to control state transitions, or to execute independently as actions, but there’s no real place to add libraries of code that can be called from other code, which makes it awkward to do anything non-trivial. Insight Maker code is using its own private language, invented by the author of Insight Maker. It seems quite competent for a small language, but it doesn’t feel like a full-strength programming language. When developing software, it’s nice to be able manage multiple versions of the code base so you can try different approaches and easily back out of bad ideas, but there’s no easy way to manage multiple versions of Insight Maker code. You can download a model into a file, which you can edit in other tools, but you can’t easily modify or use the model in that format. Insight Maker doesn’t have libraries of open source code that you can leverage in your program to add features or speed development. Insight Maker graphic output is limited to only certain types of data and certain types of charts. Insight Maker doesn’t appear to be thriving. The official Insight Maker forum has only had 15 topics posted in the last three months, and the Insight Maker news stream hasn’t been updated in almost a year and a half. Something like MATLAB/Simulink, in addition to possibly being pricey, is also really intended for modeling physical systems, not system dynamics or the sort of agent-based modeling I was doing. Wolfram SystemModeler is similar, which is a shame, because I already have a home user license. Speaking of Wolfram, I could probably use Mathematica, because you can do anything in Mathematica, at least according to the folks who make Mathematica. I have a home user license for that too, and I’ve already used it on this project to generate some of the graphics for these posts. The problem is, I get frustrated with Mathematica when I try to do anything complicated, because it’s not like a normal programming language. But that got me thinking…maybe what I really need is not a simulation tool, but an ordinary programming environment in which I can build a simulation. It wouldn’t have the fancy drag-and-drop block diagrams that all those simulation products provide for building models, but I’m not sure I need that for what I’m doing. I think the connections and flows are simple enough that I can model them with ordinary programming structures. In that case, the obvious choice for me would be C# and the .NET Framework, since that’s what I work with on my day job. I have access to a ton of development tools, and I’m very familiar with useful code patterns, the development toolchain, and the general approach to developing a C# project. On the other hand, C# is geared towards building production-quality systems, but since I’m still designing the model, I would probably benefit more from a development environment geared toward ad hoc queries and prototyping. I think I need something that works like R Studio, where I can type in simple commands to change things, run code, and see the results, so I can easily try lots variations and ideas. Or maybe I’d be better with a notebook-style interface, like Mathematica. Both of those also provide data visualization, so you can change something, run it, and see a graphical representation of the result. I don’t actually want to use either of those, however, because I find both R and Mathematica’s “Wolfram Language” to be very annoying for writing anything substantial. Python is a full-strength software system with support for multiple-file software projects and organizational abstractions such as classes, modules, and packages. Python is a mature, well-known, and widely used language. Python is supported by numerous integrated development environments, including Eclipse (with the PyDev extension), Sublime, Visual Studio, Spyder, and PyCharm (for which I already have a license). Python projects are just files in directories, so you can easily edit them in a variety of ways and version control them with git. There are tons of usable third-party open source Python libraries at PyPi. Python is thriving and growing as a programming language due to its popularity among the data science community, so there are plenty of resources. There are development environments for Python that support both an R Studio-style environment (Spyder) and a notebook-style environment (Jupyter). Of course, to use Python, I’m first going to have to learn Python. Writing tiny programs is easy and quick, but I want to build up a library of modeling components, so I need to learn about things like Python classes, Python modules, and Python packages, as well as figure out a development environment, all before I can start building the model. I think it’s going to be a while. 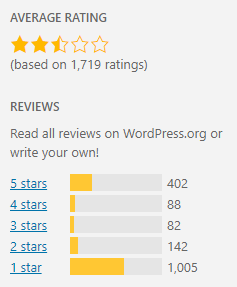 WordPress has been threatening us with their new Gutenberg editor for months now, and I guess it’s finally arrived, despite the fact that the trial Gutenberg plugin has been getting abysmal reviews. What the hell were they thinking? Gutenberg is trying to be some kind of low-rent page builder, allowing users to drag and drop feature blocks into a page. People who use WordPress to build commerce sites love that sort of thing, because it gives them complete control over the design of every page on an individual basis. I use WordPress for blogging, however, so I hated Gutenberg on sight. Look, I just want to write stuff. I don’t want or need to make every single page look unique and different. Blogging for me is about content, not visual design. When WordPress started talking about Gutenberg, I ignored it, because it figured it would just be another editor. I didn’t expect such a drastic change. I didn’t expect that I would have to stop and learn a new way of posting stuff. In essence, WordPress Gutenberg has broken the fundamental workflow of blogging: Open the page and start writing. In the long run, It’s not going to be a huge deal for me. I deal with technical blogging stuff all the time, and I’ve worked with page builders before, so I’m sure I’ll get used to it. But I suspect some of the more curmudgeony bloggers out there (I’m looking at you, Greenfield!) are going to hate this change. Note that it has already been installed by over 700,000 users. I’m one of them. I threw this post together in a few minutes in the old editor. 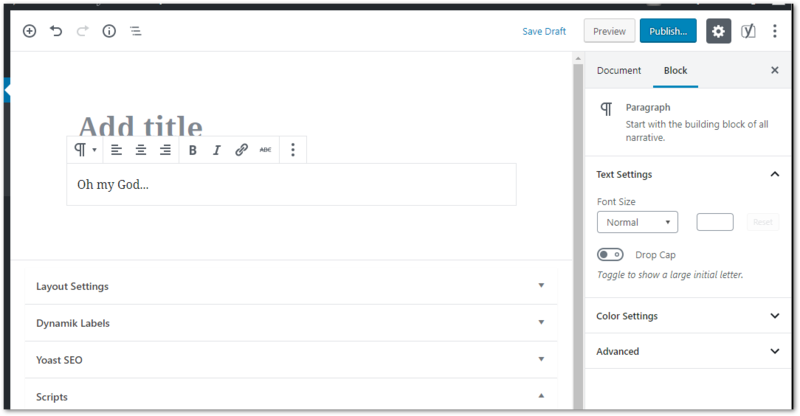 Update: If you only want to disable Gutenberg for some of the users on your blog, there’s the Disable Gutenberg plugin, which gives you detailed control over when and for whom Gutenberg is active.